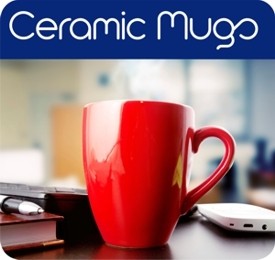 The traditional 'Earthenware' mug is a durable, inexpensive and highly effective promotional product. Delicate in appearance but an extremely durable product. Fantastic selection of cups and saucers, tea or coffee sets and dinner services; there are Bone China products available to suite every budget. With classic appeal and available in a stunning range of contemporary styles and colours - Branding possibilities can be tailored to suit your needs. At The Advertising Gift Works we offer a large range of Bone China products, available in a variety of colours, shapes and designs, suitable for every occasion. Why choose a Thermal product? At The Advertising Gift Works we offer a wide range of personalised Thermal products, available in a large array of styles, colours and shapes to suit any industry. Available in a range of vibrant designs and colours that are cured using UV light, allows for far more vibrant colour when compared to ceramics, making sure your product stands out from the crowd. At The Advertising Gift Works we offer a large range of Plastic products, available to be printed in a variety of methods from single colour to full colour wraps giving you maximum exposure, a vast range of shapes and designs are available, suitable for every occasion and budget. If you'd like to see our entire range of over 1700+ mugs and drinking vessels - Click here! Apart from the promotional pen Mugs are by far one of the most popular and successful promotional products ever. It's not difficult to see their popularity, highly practical, used in the home and at work, mugs are seen in every conceivable location and printed or personalised with your company logo or corporate message provide a most effective form of advertising and a very acceptable gift, let's face it we all have lots of them, we all have our favorites and they all get used and noticed by everyone everywhere, we've set out below some of the most common styles of promotional or printed mug you can use to promote your business or advertising campaign. 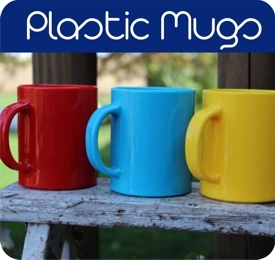 Let's start with the most basic, Earthenware Mugs are the most popular and cheapest mugs available. They come in a variety of popular shapes including the Sparta Mug straight sided ideal for printing your logo but with a curved lip and distinctive angular handle making it comfortable to hold and drink from, the Sparta Mug has a simple but attractive stylish design. 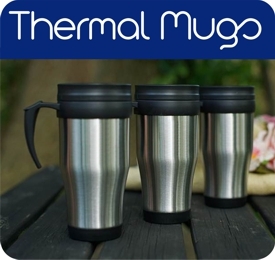 other popular and cheap mugs include the Durham Mug, Cambridge Mug, Bell Mug, Marrow Mug and of course the ubiquitous so called Brickie's Mug, it's defined by its solid straight sided design with a large looped handle making it easy to hold, there is also a larger and notably wider version of this style called a Columbia Mug, this has the advantage of a larger liquid capacity and also a bigger print area to give maximum impact to your promotional message or brand. 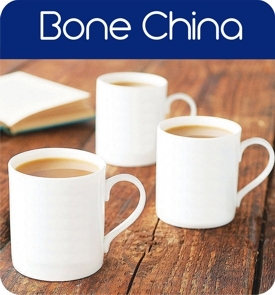 Next we have China Mugs conveying a quality look and feel, important when image is important to your promotional campaign, China Mugs, bone China or Porcelain mugs, are lighter being a slimmer mold, much brighter white in their translucent appearance due to the China clay content. China Mugs, coffee cups and saucers are more fragile and roughly about twice the price of Earthenware Mugs, but our elegant making them ideal for important VIP presentations, for use in the Boardroom or Hotels and conference venues and corporate hospitality, popular styles include the Topaz, Opal, Windsor and Balmoral mug.